At Kawanhee’s core is an appreciation for the natural world and our place in it. Kawanhee’s singular setting, on a pristine lake among some of Maine’s finest mountains, inspires a sense of wonder and respect for what the natural world has to offer. Our primary goal has been to define and strengthen the values we hope to instill in our campers as future stewards of our local lakes and mountains, as well as of our world at large. Some of our campers will participate in the local loon count, and others may be involved with the local land trust in monitoring water quality in the lake or learning about invasive species. The hope is that all Kawanheeans will become more conscientious citizens of the world, walk more lightly on the earth and practice “leave no trace” in the wild. For many, “camping out” is one of the great joys of boyhood. Many first-time campers arrive with the dream of sleeping in a tent or under the stars and preparing meals over an open fire. Our campcraft program offers instruction in these arts of outdoor living. 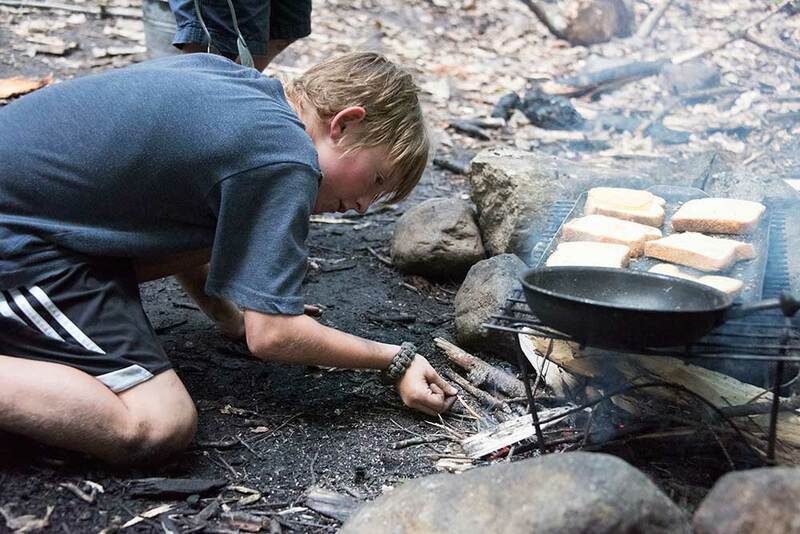 Boys learn how to prepare for a trip, choose a campsite and set-up camp, build a fire, use a map and compass, cook a meal, and so on. 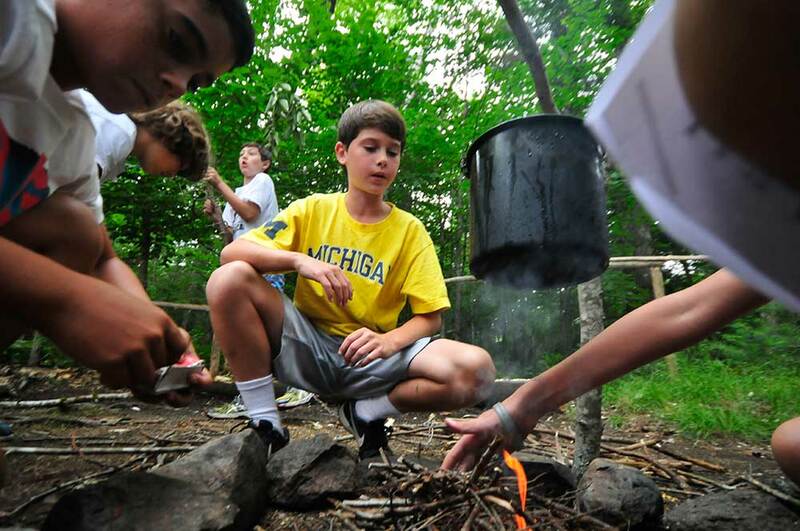 Skills learned at camp can be applied during overnight trips in the outback. At a camper’s option, this instruction can include traditional skills employed by Native Americans. Every summer, we contract with the founders of the Koviashuvik Local Living School (www.koviashuvik.com) to offer instruction in the making of wooden spoons and bowls, packbasket weaving, moccasin-making, kindling fires without matches or accelerants, and other primitive arts. 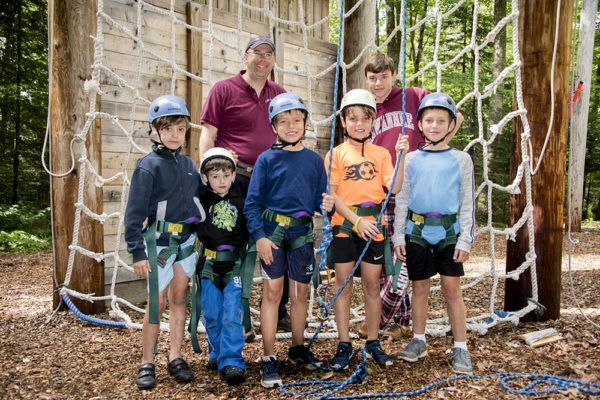 A natural extension of an interest in camping is participation in the Junior Maine Guide program, sponsored by the State of Maine and available to campers at least fourteen years of age. Kawanhee is one of about a dozen camps in Maine that sends JMG candidates to a remote testing camp for several days, to be evaluated by registered Maine guides. Testing camp is the culmination of several weeks of intensive preparation in camp, building skills such as first aid, axemanship, orienteering, wet-weather fire-building, personal shelters, canoeing, menu-planning and campfire cooking, among others. Although JMG is considered a two-summer endeavor, some candidates are able to pass the requisite number of tests and earn their JMG in one summer. Among Kawanhee accomplishments, JMG is considered one of the most prestigious. Kawanhee’s Challenge Course, which includes a 40-foot climbing tower and various high and low elements, was constructed by Project Adventure almost twenty years ago. In the years since, the facility and equipment has been carefully inspected and maintained. In the fall of 2017, an ambitious three-year expansion of the Challenge Course was completed. 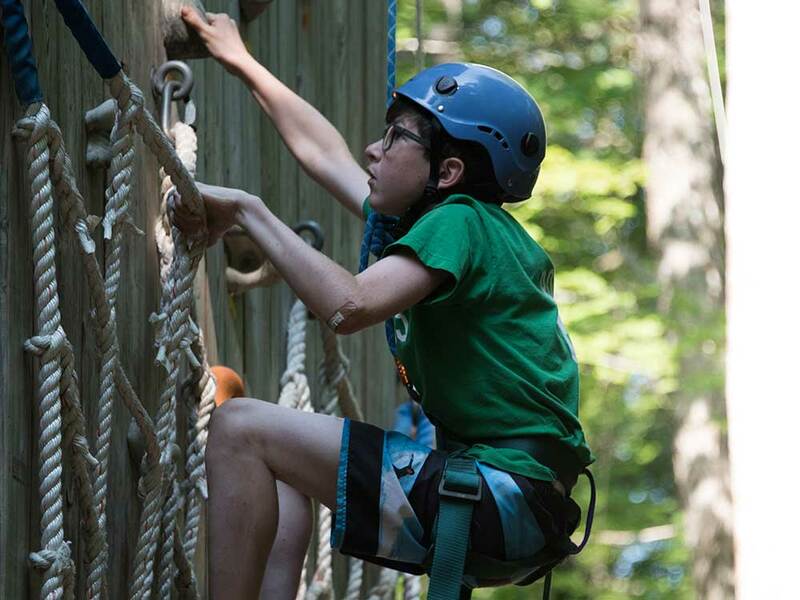 The facility is much in demand, not only by Kawanhee’s campers during the summer, but also by authorized off-season groups who drive a considerable distance to experience one of the best challenge courses in Maine. The Challenge Course is a model of experiential learning that involves participants in a variety of group and solo activities aimed at developing strength, confidence, problem-solving skills, trust in others and cooperation within a team. At various points during the season, those with interest can test their climbing skills by partaking in rock-climbing trips guided by seasoned outfitters. The camp environment is an unusually rich laboratory for learning about the natural world, with plant and animal life in abundance. Our nature study program is hands-on. Campers spend time in the field in and around camp, directly observing birds, insects, land-based animals and flora and the web of relationships among these life forms. Counselors may take their lodge groups out to the athletic field after dark to watch a meteor shower, practice identification of constellations, and, if the conditions are just right, behold the northern lights. 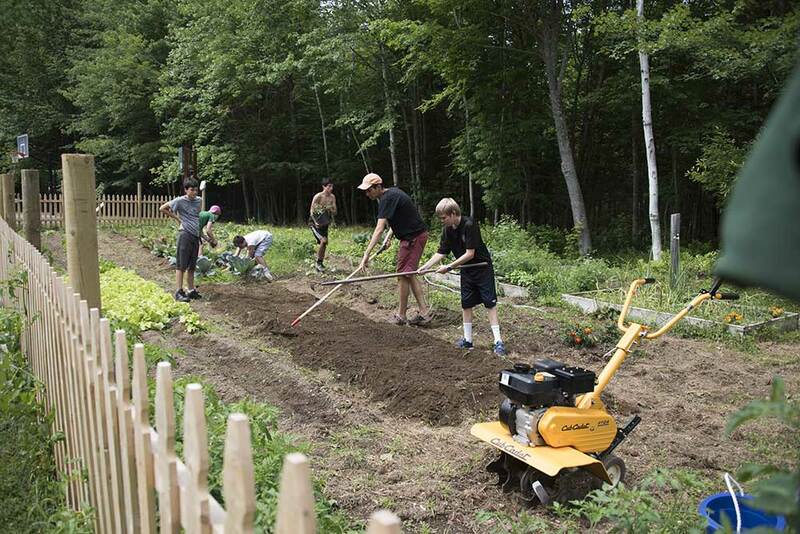 By day, there are the camp chickens and the camp garden that need tending. 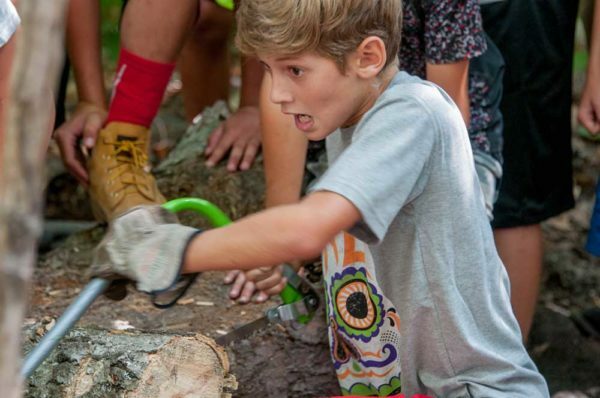 There are also opportunities for campers to collaborate with members of the Webb Lake Association to participate in the annual loon count, monitor water quality in Lake Webb, and inspect the lake for evidence of invasive plant species. For those interested, John Bell, a year-round Weld resident and life-long fisherman, is available to offer advice on successful fishing in Lake Webb and fly fishing instruction for those who want to test their new skills on nearby streams. 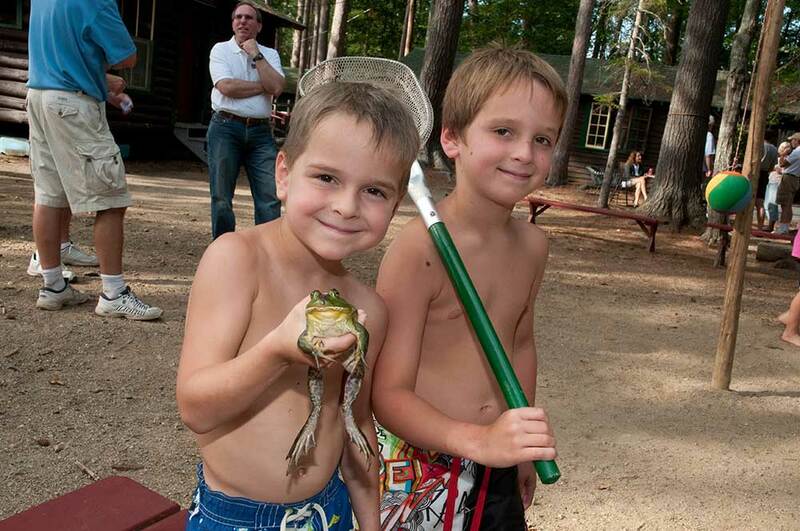 Farther afield, boys may take trips to the local organic farm or to the nearby Swift River for gold-panning. Such intimate contact with the natural world inspires campers and counselors alike to become more appreciative and mindful citizens of the world.